A dog tag, or ID tag, is a idenitfication method that is typically hung from a dog's collar. A dog tag should include the name of the dog and the owner's name, telephone number and address. The purpose of this dug supply item is to identify the dog in case it runs away from home or becomes lost. If a neighbor or stranger approaches a dog with a dog tag, he or she can easily identify where the dog belongs and can contact the owner. This way, the dog will not end up at a shelter or worse. When you first adopt or purchase a dog or puppy, a tag should be one of your first investments. And there is no excuse not to have one, because id tags are extremely easy to find online or at retail stores. Some retail pet stores, such as Petco, have Quick-Tag kiosks, where you can actually create your own cutom-made, stainlees-steel pet tags within five minutes. The stand-alone system uses a video touch-screen in which you simply follow step-by-step directions to make your own pet tag. Then, the computer-driven engraver will engrave the tag while you wait. You can choose from six different shapes and styles of ID tags. 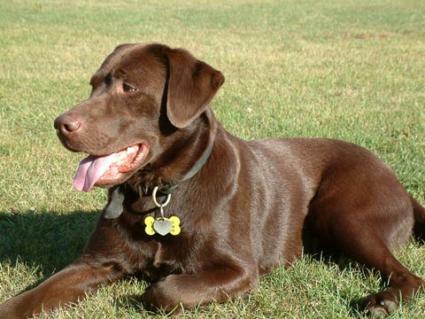 This type of dog identification is the least expensive, usually costing around $5-8. Another way to purchase a dog tag is to fill out a form and mail it to a manufacturer. Then, within a couple of days, you will receive your dog tag by mail. A relaible site that offers this service is Pettags. At Pettags, you can choose from both metal and plastic tags, which feature various cartoons and fun shapes. Just like everything else, dog identification has gone digital, too! A Dog E-Tag is worn on a dog's collar, just like a metal tag, but can include much more information. This digital tag can store up to 40 lines of information, including names, numbers, medical info, and whatever else you would like to include about your dog. You can find Dog E-Tags at your local Petco or online.